In May, we set out once again for our 4th Rangate Euro Tour- an annual tour bringing together a group of North American window and door woodworkers to see some of the world's advanced window and door manufacturing facilities, visit the year's biggest solid-wood industry trade show, and enjoy the camaraderie and connections that build each tour- not to mention the culture, cuisine, and renowned sights of Europe. Joining us were a mix of old and new friends- for some, it was their third Rangate Euro Tour. To us, having guests return means two things: That we're providing the kind of valuable experience that deserves a return trip, and that we've got to deliver a fresh and exciting experience each TOUR! 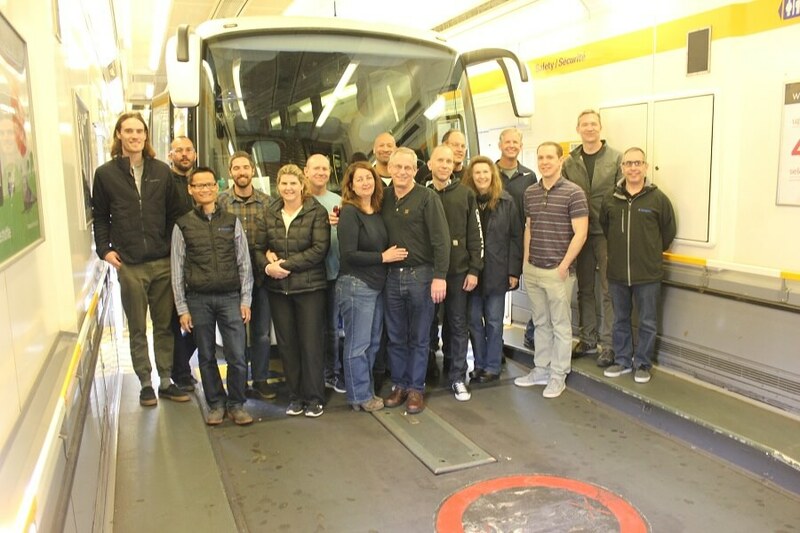 This year we charted a new course, making stopovers in England, France, and Belgium for the first time, and finishing with a few shops near Hanover, Germany, before concluding at the LIGNA woodworking expo. During our two days in England, we visited four shops- a whirlwind tour of learning. England’s shops had a lot to offer for our interests. 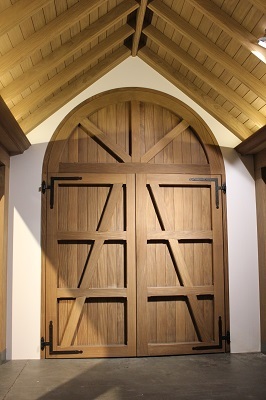 It’s a fast-growing marketplace for wood windows and doors. Our North American window and door styles are quite similar to England’s, such as the Double-Hung and other sliding sash styles. 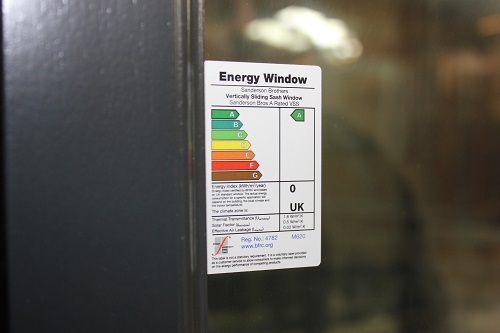 Similar to North America, England is also highly active in promoting and regulating higher performance windows and doors to provide higher quality, longer lasting products, and most important of all, reducing energy consumption while increasing indoor comfort. These were great reasons for our initial thoughts when planning our TOUR – productions and finished goods which we could closely relate to. 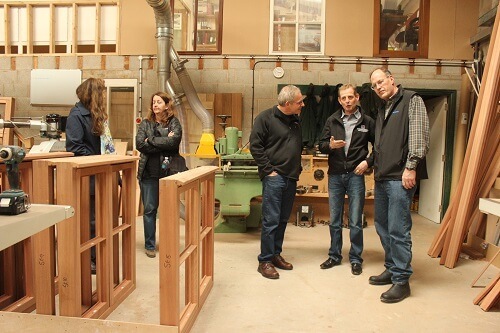 At all the shops we visited, we toured the entire production, from where materials enter, to where the finished windows and doors leave– from scantlings to machining by traditional, to CNC angular, and routing window and door machines. We dug into the post-machining processes as well, from finishing to hardware and glazing installation. Our hosts were extremely gracious and were happy to dig into the business side of the shop's process as well, getting into deep discussion with our TOUR about the workshop flow, business plan and local window market environment. Some of our repeating attendees recognized that, unlike our previous years of visiting mainland European shops, we were able to communicate directly with the English shop operators who generously opened up their shops – and added benefit for this portion of the TOUR. We finished up with excellent cheers at a local English pub. Our transit to continental Europe was one to remember- we got to experience riding through the "Chunnel" running under the English Channel on our way to France. To be riding comfortably at 100mph while the entire English channel flowed above us was quite an experience. We spent the weekend in Bruges, Belgium to enjoy some time with our new friends, and one of the most beautiful and well-preserved Medieval cities in Europe. The city is known for its historical charm, and it worked its magic on our group- after our whirlwind tour of England, having two days to explore and sample some of Belgium's world renowned brews, frites and waffles was welcome. This was also an excellent time for everyone to get to network and sharing the challenges, successes, and strategies we experience in our businesses – and even potentially build business synergy and new friendships back home. 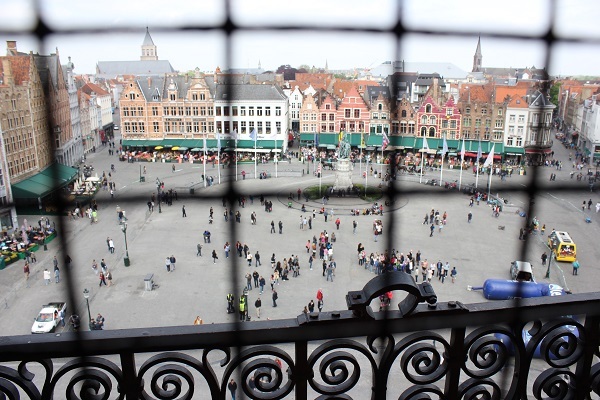 After resting in Bruges, we were ready to see some the country's most advanced window plants. We visited two shops in Belgium before heading to Germany. One of them had an enormous showroom, displaying life-sized living rooms and building exteriors with their beautifully made window and door products. We often see very well-presented show rooms with attached production shops throughout our past shop visits; this one was just outright impressive to see how many high quality products were installed, and how they looked and operated in real life! As we traveled across Western and Central Europe, we noticed that each year we visit, there's more and more production of higher- performance windows, including ones suitable for Passive House construction. Various styles, including tilt-and-turn windows and lift-and-slide doors were common at the shops we toured. We also visited a shop with a PVC plastic window production along with their wood production area. It’s very interesting to see the different modes of operation. The PVC side of the shop was highly automated, with less labor and 6-meter extrusions in a few different colors being made in an assembly-line fashion- drainage punched, cut, mitered, and assembled – versus the wood side, where the machining stations displayed many operators' joinery and carpentry skills. We’ve observed this in our past years that as the market demand for wood product increases, some PVC shops had extended their wood window production, while continuing their PVC product manufacturing. Wood's share of the overall window and door market is only increasing, year after year. 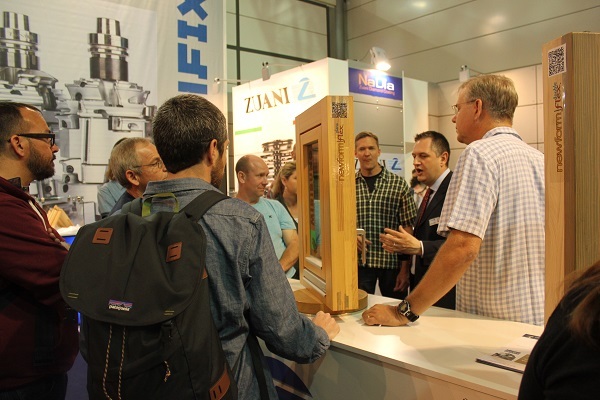 It was then on to the last leg of our journey – visiting LIGNA, the year's largest solid-wood industry trade exhibition, in Hanover, Germany. A good portion of the expo and exhibitors were focusing on window and door productions, while many were excellent resources for everyday woodworking from the first industry to finishing products, and from traditional machinery with new features to highly automated CNC machines. And so, we were coming to the end of another memorable and successful Euro TOUR. The 4th TOUR was completed with a comfortable full bus service, new friends and delicious food. As our time together wound down, we celebrated with a group dinner hosted by our partners Zuani and Soukup America. The size of our little group more than doubled for an evening, as professionals from all parts of our wood window and door industry from across Europe and North America were drawn together by our event to connect and form the beginnings of ideas that might help grow our whole industry in the years to come. The mood was relaxed and festive as we celebrated another successful tour, and some great friendships and business developments getting their start. The conversations at the table reminisced about the memories we'd created together as a group, and the knowledge and relationships our group would be bringing back to North America with them. Whether it was ideas on shop layouts and equipment, or inspiration on product lines and future growth, everyone was taking away some valuable insights which would help their business reach its goals. Though it seems like yesterday, we're already planning to outdo ourselves again for 2016- whether it's your first TOUR or you can't wait to go again, check out what we're planning for next year, and book early- we're already about halfway full!